We're all familiar with the strong note of a single spice or herb dominating a dish: cinnamon in an apple pie, cumin in a chili, oregano in a pizza sauce. But when it comes to getting creative with more than one spice or herb, our courage often falters. Instead, we reach for the jar of prepared ground spices or dried herbs, favoring such brands as Old Bay or Lawry's or generic blends with such labels as "curry powder" or "Italian seasoning." Even if you don't feel like concocting your own spice blends, there's still a wider variety of flavor mixes than you might think available for purchase either online or in ethnic markets. Read about these eight beloved blends from around the globe, then start trying them out at home. #(clear n1). Baharat. Sweet, savory, and warm with subtle heat, baharat — which means “spices” in Arabic — exemplifies the culinary spirit of the Levant. Black pepper, cumin, coriander, nutmeg, cloves, and cardamom appear in most variations, but some also contain generous proportions of paprika and allspice; in North Africa, baharat is especially fragrant, perfumed with crushed rose petals. 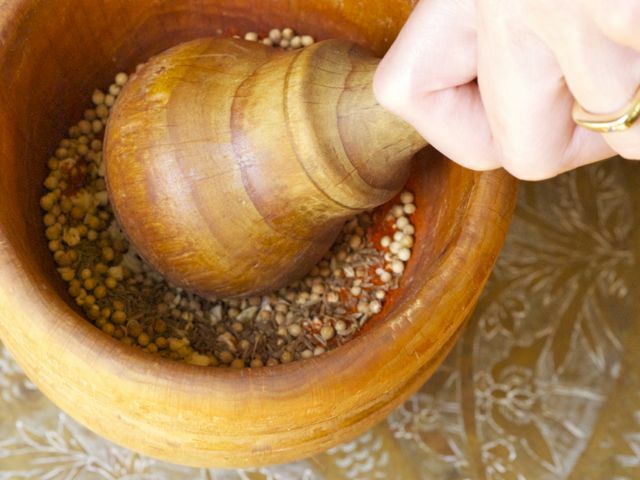 Use baharat to season kofta kabobs, couscous, or lamb made in any fashion. Baharat also loves eggplant, and if you can break with tradition, try it in a batch of ratatouille. #(clear n2). [%image reference-image float='clear right' width=350 caption="Tabil is a blend of coriander, caraway, garlic, and cayenne."] Tabil. Caraway, coriander, cayenne, and garlic place tabil, a simple Tunisian spice mix, somewhere between earthy and pungent and bright and citrusy. Tunisian cooks use tabil liberally in all manner of soups and stews. Its sunny notes are just the thing for a hummus-inspired chickpea soup garnished with a bit of harissa and hard-boiled egg. It’s also a low-maintenance, high-impact way to brighten up a platter of roasted vegetables or grilled fish. Blend it with a bit of oil and go. #(clear n3). Za’atar. Heady with dried oregano, thyme, citrus-scented sumac, and nutty-earthy sesame seeds, za’atar is a seasoning blend popular in the Middle East and Iran. Persian and Lebanese restaurants often serve it sprinkle atop a dish of olive oil as an accompaniment to flatbread, but it also adds zingy depth when stirred into soups and stews, added to a batch of pesto, or sprinkled onto a pile of braised greens. #(clear n4). Ras el hanout. Used throughout Algeria, Tunisia, and Morocco, ras el hanout resists pigeonholing. The name translates as “best of the shop,” and merchants might mix their signature offering from more than 30 different spices, which leaves plenty of room for variation. Popular versions, though, tend to be heaviest on cinnamon, cardamom, nutmeg, black pepper, and turmeric. They're used to infuse the region’s rich, meat-based stews, or tagines, with ethereal fragrance. You can also use it as a rub for roast chicken, or to turn simple red lentil soup into a dish of enchantment. #(clear n5). Herbes de la garrigue. You're probably familiar with herbes de Provence, that dried-herb blend from the south of France. Herbes de la garrigue is a bit of a rascally cousin, the one who sneaks out on weekends and has more fun. (“Garrigue” refers to the scrubland of southern France, untamed but gorgeous in its own way.) Redolent with rosemary, thyme, savory, and bay leaves, herbes de la garrigue is excellent on a smoky, grill-roasted leg of lamb, but you could also blend it with a bit of olive oil before massaging it into torn pieces of stale pain au levain for a bread salad. #(clear n6). Berbere. There are two distinct fragrances that give Ethiopian cooking away: nit’ir qibe, the ubiquitous spiced butter, and berbere, the fiery, rust-colored spice blend heavy with chiles and paprika that laces some of Ethiopia's best-known stews, or wots. Berbere also partners well with the vegetables of late summer and early fall. Try using it in a soup built around browned onions, kabocha squash, and lentils, or as a racy garnish for deviled eggs. #(clear n7). Panch phoron. If you’re a fan of northern Indian cooking, the Bengali five-spice mix known as panch phoron should sit on the go-to shelf of your spice rack. Along with garam masala (which really has run away with the Indian spice-blend show, even showing up in gelato) panch phoron captures the distinctive taste of Bengal. It’s warm, earthy, nutty, and slightly bitter, and, because the spices aren't ground, a mix comes together in no time. A mixture of equal parts cumin, fennel, black mustard, fenugreek, and nigella seeds, panch phoron is frequently prepared as a tadka, in which whole spices are fried in oil to release their fragrance, then added to a finished dish. But the blend can also be added to a dish earlier in the cooking process, provided the spices are given the opportunity to toast. Whether you choose frying or toasting, prepared panch phoron is a cinch to work with and agreeable enough to complement almost any vegetable, though it particularly charms the socks off cauliflower and onions. For an early-summer treat, pair it with whole roasted new potatoes. #(clear n8). Tempero baiano. Brazil’s answer to North Africa’s ras el hanout, tempero baiano is aromatic and complex. Every Brazilian kitchen (every cook, really) has its own interpretation, but most versions list white pepper, oregano, parsley, and any number of varieties of chile among their constituents. Some spicier versions contain turmeric and cumin, while others are more herbal and might also include marjoram, basil, and bay leaves. Brazilian cooks use tempero baiano with abandon (the blend originated in the country’s northern state of Bahia and translates to “Bahian seasoning”), and you might find yourself doing the same. After you put together a version with your name on it, use it to season your next pot of beans, a shellfish boil, or a mess of sharp greens (mustards or collards would be choice) tempered with coconut milk. p(bio). Emily Horton lives in Washington, D.C., where she writes about traditional foodways, local food issues, and sustainability.